One thing I would really like to know more about is plainchant. I know James the Deacon accompanied Paulinus to the north and spent the rest of his life there. But I’m trying to imagine what it must have been like for Hild to hear that kind of music for the first time and fall in love with its cool clarity. Right now she thinks, It was the music stars might sing. Were it water, it would turn any bird who drank of it white. But I’m prepared to accept she might just think it sucked. 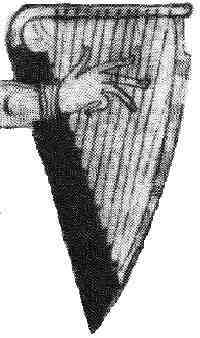 I am going to check out the web site on how to make a copy of the lyre. I have a good friend in Western NY who can do wonderful things with wood. I would love to play that thing! The different sounds you can get from a lyre are astonishing, aren’t they? I’m always falling into the trap of thinking historical = primitive = simple. Happily I keep being proved wrong. Ah, the music wars, which probably began when some human picked up two sticks or bones and hit them together, or hummed tunelessly when she had to take a long walk or climb. How the devil did people learn that plucking a string made music? Our ancestors are amazing folks. barbara, I think some of the first music–after voice, of course–was probably percussion: musical rocks (flints, stalagtites, etc.) and hollow logs. As for the strings, probably a bunch o’ kids messing around with sheep guts :) Failing that, some bright spark noticing that bows of different lengths made different thrumming sounds when the arrow was shot. I never thought to ask you. You sibg beautifully. Do you play any musical instrument? barbara, no, not to speak of, though I’ve tormented pianos, drums, guitars, bass, whistles etc. in my time. None of it for public consumption, just doodling. I haven’t touched any kind of instrument for years.